This past weekend a new Colorado wine event was born: Winter Wine Fest. The event was brought about by the Two Parts (formerly Imbibe) event planners and Grand Junction Visitors and Convention Bureau to provide Denver with a Colorado-themed wine event. The slow winter months just happen to be the best time for wineries to attend such an event in Denver. For a first-year event it was very successful - over 400 guests attended to taste wine from 17 different wineries. Through my position with the CO Wine Board, I attended to pour a selection of wines from the 2015 Governor's Cup Case for VIP guests. The feedback from both consumers and wineries was positive. I will be interested to see how it grows in the future. 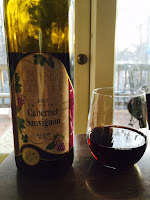 One of the wines we poured was the Creekside Cellars 2012 Cabernet Sauvignon (13.9% abv, Sample $35). There was bit more than half a bottle remaining, so instead of dumping it I brought it home to have during the Super Bowl. This Cabernet is rather light for Cabernet - in both color and body. More than one person at the Winter Wine Fest asked if it was Pinot noir when I poured it for them. It's not anything like Pinot, but I can understand their confusion with what comes in some of the more popular Cabernet bottles from California. In fact, we pour this one before the Cabernet Franc and Petit Verdot we also poured. It is a lovely translucent red color and is quite aromatic. On the nose there are aromas of flowers, spices and dark fruit. This wine is all about finesse and not power, but still shows a lot of complexity. The smooth tannins complement the clove, leather, herbs, cherry and blackberry flavors that caress the palate. The combination of flavors and brightness of the acidity harken to an old-school style of Cabernet Sauvignon not afraid of embracing the grape's savoriness. It is a lovely wine that will probably disappoint those looking for the upfront fruit and concentration that hijack so many Cabernet Sauvignon. Thank you for giving me a peak at what Colorado is doing with wine! I have not ventured far outside of the West Coast in my American wine experience. Given my location (Louisiana), I HAVE tasted non-vinifera wines from my home state, along with a few competent Texas reds. The problem with CO skipping the minors and going straight to the majors is that mother nature sometimes throws a wicked curveball and destroys everything. Having a minor league would allow some portion of local grapes to survive. I think vinifera will always be what CO holds its head high with, but sometimes hybrids/native cultivars will be keeps us standing - and allow wineries to expand into the sub $10 market.